We present in this initial exhibit four extraordinary banners from the nineteenth century and twenty seven garment industry banners from New York City in the twentieth century. These American labor banners—neither as omnipresent nor as lavishly illustrated as those found in Great Britain—can be revealing if we read the clues sewn into the fabric. But first we must find them. Many still hang in meeting rooms; others lie overlooked and forgotten in basements below, or have been discarded. Labor Arts has undertaken a project to make the banners accessible to a broader audience, by displaying photographs of labor union banners from all over the country. We urge anyone within sight of this exhibit to help us in our search for additional photographs of these significant symbols of labor solidarity and strength, and to help us collect information about how they were designed, made, and used over the centuries. As you look, note the recurring themes: strength in unity, the dignity of work, pride in skilled craftsmanship, patriotism and loyalty to the nation. Symbols for these themes recur as well—raised fists signifying strength, hands shaking to evoke conciliation and cooperation, eagles for national pride, and tools of the trades to illustrate skill and dedication to a craft. There is surprisingly little emphasis on conflict—aspirations are more likely to be portrayed than demands, perseverance more common that struggle, unity and pride the identifying characteristics throughout. 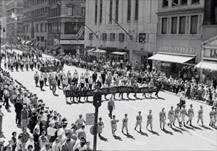 The four nineteenth century banners to the left include the oldest banner we found, carried by the Society of Pewterers of the City of New York in a parade in July, 1788. 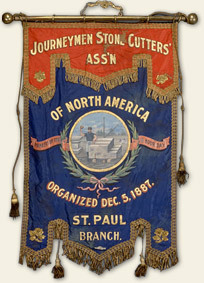 Click on each banner for additional information, and on the extraordinary banner from the Journeyman Tailor’s Union of New York from 1887 to proceed to the collection of banners from the garment industry.